I’m back in the saddle, or at least on the horse. The saddle may have to come later. It was my intent to post something much sooner. I said at the outset of creating this blog that it was my goal to post daily, or close to it. It seems I lied. My post frequency has been closer to weekly, or certainly that’s what it seems anyway. ‘Things’ just get in the way. Poor reason/excuse I know. I haven’t even posted photos for the Weekly Photo Challenge lately (to be honest I’m not even sure what the topic is. The summer has been proceeding at a pace unforeseen or unexpected to me. In many ways it’s just been a spring and summer that has taken on a schedule that I don’t like. I’ve done numerous trips, by car and within 1000 km (~600 mi.). Some have been for pleasure and a few have been to see or support loved ones in need. That being said, I appreciate that I shouldn’t lament the reasons, and I don’t, it’s the time away from my castle and my ‘stuff’ that I lament. That and my apparent inability to manage my time effectively when I am at home. One thing you do get is to see a bunch of interesting stuff when you’re on the road. 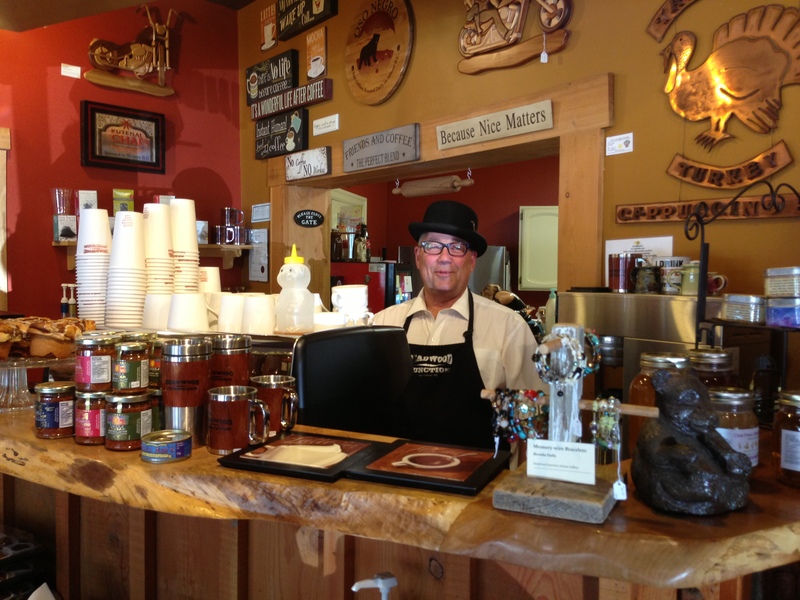 This gent was operating the espresso machine at a coffee shop on the road called “Deadwood Junction and Tarnished Turkey Cappuccino Bar”, one of my favourite haunts while en route to Kelowna or back home from a visit to my grandson. You can see it hasn’t been all bad. It’s just that since I retired last year I often feel overwhelmed and under capable to handle my various stresses, most or all self inflicted. Plain and simple I see my world as full of these opportunities and things I want do, and certainly there’s no shortage of things I should do. There’s always cutting the lawn, doing dishes or the laundry, shopping, cooking, washing or maintaining vehicles etc. etc.. Never mind the fun stuff like camping or seeing my grandson. Woe is me, my life is sooo tough isn’t it. Just smack me upside the head. Like camping was such a hardship. 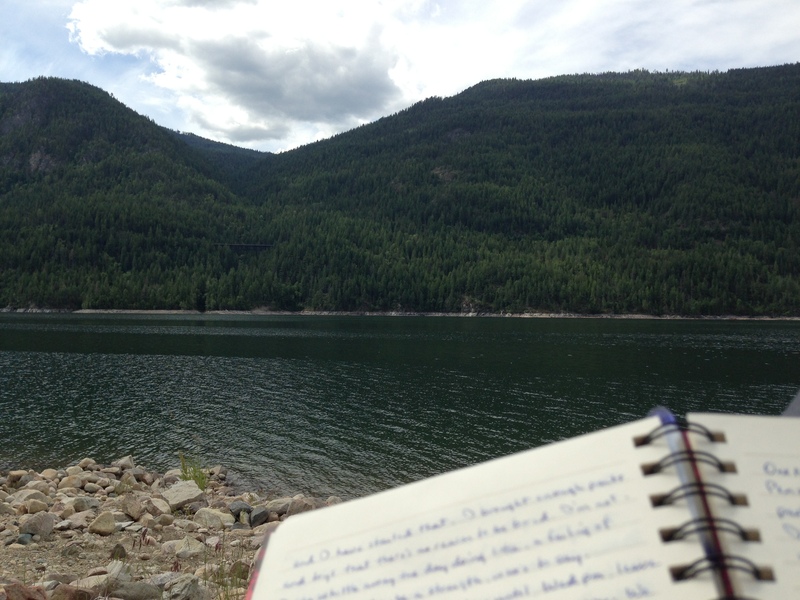 While I didn’t post much I did do some journaling, and what a view. The photo doesn’t do it justice, albeit this was with my phone. Early retirement has provided me with challenges I didn’t see coming. Many people have asked me since I retired “What do you do?”, or “How do you stay busy?”. I just laugh. Life is so full, how do I get to do everything I want to, that’s the question. Coffee, Coffee, Where Art Thou? I’m on the search, seeking out that perfect cup of coffee. Hell, not even perfect, just one I’d choose to sip time and time again. MY perfect cup of coffee. I have more time now, well not necessarily more time just a different use of it. I have different interests and priorities, not job/work but personal/work, now I do what I choose to do with no master other than myself (and my wife of course, lol). My retirement has given me that. One of the more recent interests I have chosen to pursue is that elusive cup of the golden nectre, that cup of morning joe, the delicious and aromatic java that teases your senses with it’s intrigue. If you like coffee you know what I mean. I have friends that make such a cup. I aspire to their greatness. 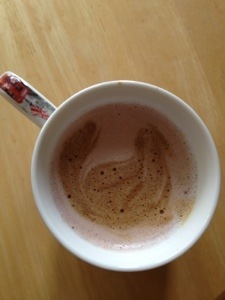 I yearn for the ability to create such a masterpiece that my friend ooh and aah after sipping such a creation. Oh such lofty goals. In anticipation of such a result I’ve pulled my bodum and stove-top epresso maker out of storage. I’ve perused the ‘net in search of tips, how DO I make such a treat? I’ve purchased a Starbucks blend called Verona, the barista there recommended it as a good “all around” blend, one to sharpen my teeth on as it were. Once I perfect my technique I can try other, varying blends. He split the bag and ground half for my bodum (coarse) and half for the espresso maker (fine). Note to self: it’s espresso, not expresso. So far it’s only the espresso maker I’ve played with. One thing at a time. To this point I have played somewhat with perking time and temperature of the espresso maker. It makes a potent cup of brew, not espresso really as the coffee is not an espresso bean, but a stiff cup of coffee nonetheless. I’ve tried mixing the brew with hot water to make an Americano and the result wasn’t good, I got a watered down strong cup of coffee. Uck. I will persevere, I have the time, I have the interest. When I perfect it you can come join me for a cup. If you have any tips please pass them on, I’ll be sure to give credit where credit is due.